INDIANAPOLIS – A population heath study from the Regenstrief Institute and Indiana University Center for Aging Research has determined that haloperidol, the drug most commonly used to treat delirium in hospital medical and surgical intensive care units (ICUs), did not benefit elective thoracic surgery ICU patients when given prophylactically, with the possible exception of those who have had surgery to remove their esophagus. The study results indicate the need for a personalized approach to delirium in the ICU. 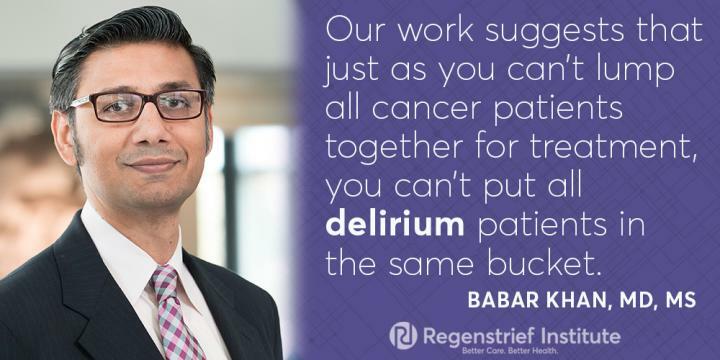 In addition to Regenstrief Institute investigator Babar A. Khan, M.D., M.S. and Kenneth Kesler, M.D., authors of “Preventing Post-operative Delirium after Major Non-Cardiac Thoracic Surgery-A Randomized Clinical Trial” are Regenstrief Institute investigators Noll L. Campbell, Pharm.D; Sikandar H. Khan, D.O. ; and Malaz Boustani, M.D., MPH; and Anthony J. Perkins, M.S. ; Sujuan Gao, Ph.D.; Sophia Wang, M.D. ; Mikita Fuchita, M.D. and Ben L. Zarzaur, M.D., MPH, all of IU School of Medicine, and Daniel J. Weber, M.D. of UCSF.